An impoverished woman who turn to prostitution to make a living in hopes of sending her child off to live a better life. The mostly good-natured man man who “saves” said mother and child. Signature Theatre’s Miss Saigon shares a few common traits with Les Miserables. Both musicals were written by the French duo of Claude-Michel Schönberg and Alain Boublil, so it makes sense. Both also set out to be prime examples of the epic blockbuster musical, one where every word is a song and big numbers are orchestrated to put the musical into musical theater. The barricades of Les Mis are matched by the swooping helicopters of Miss Saigon when it comes to iconic imagery. On Broadway, famed producer Cameron Mackintosh made both productions into long-running hits. At Signature, Eric Schaeffer and company attempt to fit as much giltz and glam of Miss Saigon onto the small Max Theatre as possible. Unable to fit a whirly bird into the production, the show instead is dressed to the nines with ripped parachutes, barbed wire fences, and metal grating that creeps from the stage into the audience. The ensemble that takes to this rough and gritty stage is strong, but has noticeable holes that makes this rendition solid, but not show-stopping. The story of an American GI falling in love with a Vietnamese bar dancer in Saigon during the Vietnam War has been criticized time and time again for misogynistic and racist themes. As a first generation Asian American whose parents escaped Saigon in a boat, I struggle with these issues. On one hand I understand why my fellow Asian Americans would be angered by this story, on the other I understand the context of the show, which is an update of Puccini’s Madame Butterfly. Yet another angle for me is that I am happy to see a show that prominently features Asian American actors, a minority that has been overlooked time and time again in theatre. The fact non-Asians were cast in this ensemble of to mix in with the Asian bar girls at some moments doesn’t make me feel too thrilled however. The show is carried upon the shoulders of the Vietnamese bar girl Kim (Diana Huey) and The Engineer (Thom Sesma), the owner of the club where she works. Kim shines so bright in her performance that I was somewhat surprised she did not get final billing during the curtain call. Alas, the last billing goes to Sesma, who does hold his own as the conniving Engineer, stealing lots of scenes with his subtle humor that gets the laughs without having to go too over the top. What makes this talented ensemble incomplete is the hole left by Jason Michael Evans who was tapped to play Chris, the American GI, but had to drop out of the production a week before opening due to a throat injury. Understudy Gannon O’Brien has done a wonderful job stepping in with virtually no prior preparation, however the difference is noticeable. Not to mention that complete lack of chemistry between Chris and Kim due to O’Brien’s sudden thrust into the show. I have confidence that O’Brien will use the rest of the run to get up to speed and hopefully the substitution will end up being a non-issue. There may not be any helicopters or other big show spectacles in this production of Miss Saigon, but Signature shows that it can pull out as many stops as possible in giving the audience a larger-than-life experience on stage. However, until the entire cast can reach a consistent level, the show feels incomplete. 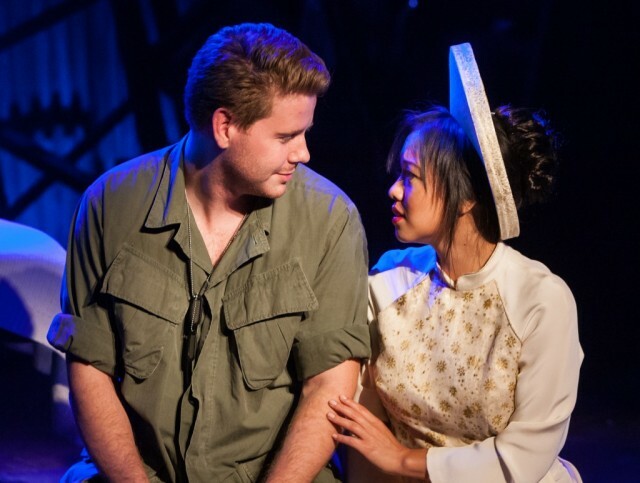 Signature Theatre’s production of Miss Saigon performs through September 29th, at the MAX Theatre located at 4200 Campbell Ave Arlington, VA 22206. Closest Metro stop: Pentagon City (Blue/Yellow lines). For more information call 703 820 9771. Every single actress playing a bar girl is Asian. Which actress are you referring to? Im still confused. I just saw the minor edit that was made. Every actress in the show minus the character of Ellen is Asian. So what actresses are mixed into the ensemble? Every Asian character is played by an Asian actor or actress. A little baffled by this comment.